Does the thought of climbing a tall ladder make you nervous? Have you put off cleaning your gutters or painting the second-floor shutters because you don't want to climb up there? 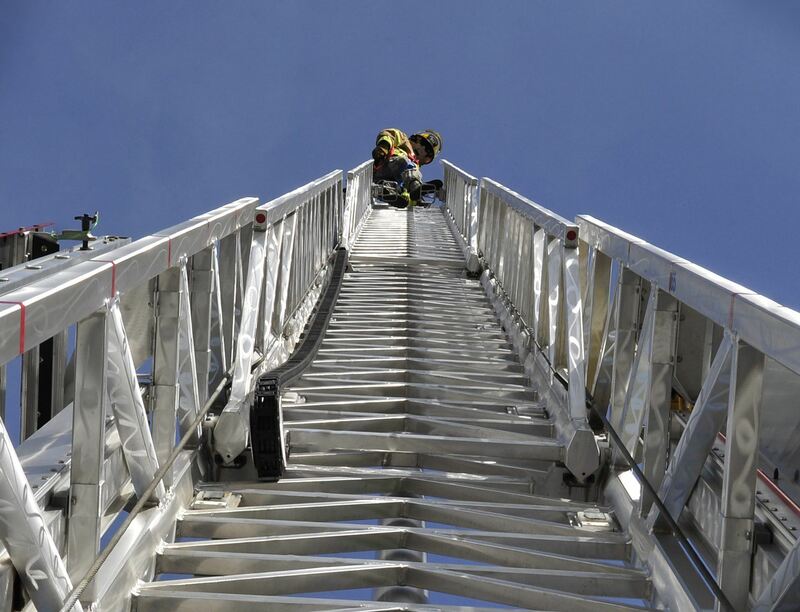 Sure, unfolding and climbing a ladder isn't rocket science, but have you ever taken the time to learn how to use a ladder safely? After reading this guide, you'll never be afraid to climb a ladder ever again! It is very important to follow these ladder safety rules anytime you need to use one. Your health, safety, and the safety of those around you are extremely important. 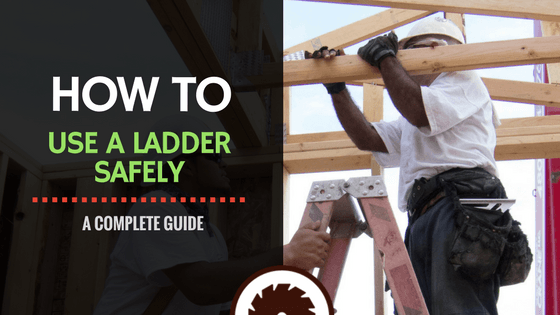 There are safety rules that you should always follow when using ladders to ensure you are safe and can do your job with confidence and ease. In this article, I'm going to show you how to use a ladder safely and efficiently. I'll give you detailed instructions on how to inspect your ladder and it's placement. There are few tools that you can use to help you make sure your ladder is positioned correctly and safely. What you'll need will depend on the type of ladder you'll be using. A step ladder is a folding ladder that has four feet that sit on the ground. Usually, it has steps on both sides, although if it's the type for use with painting, there will be a tray that extends towards the top on one side. You shouldn't climb this side of the ladder, as the tray will get in your way. A level placed across the top rungs of the stepladder will show you whether the feet of the ladder are on level ground or not. If you're working outdoors and find that the ladder isn't level, you can use a shovel to fill any dips or holes under the feet to make it level. You should never try to climb a ladder with tools in your hand. It is important to be able to grab onto the ladder to steady yourself. A tool belt or apron will ensure you have everything you need to work while still keeping your hands free. These adapters for ladders are designed to extend the foot of your ladder and fit perfectly to the ground so that your ladder stays level and stable while you work. Level - A level placed across the top rungs of the stepladder will show you whether the feet of the ladder are on level ground or not. Shovel - If you're working outdoors and find that the ladder isn't level, you can use a shovel to fill any dips or holes under the feet to make it level. Tool belt or apron - You should never try to climb a ladder with tools in your hand. 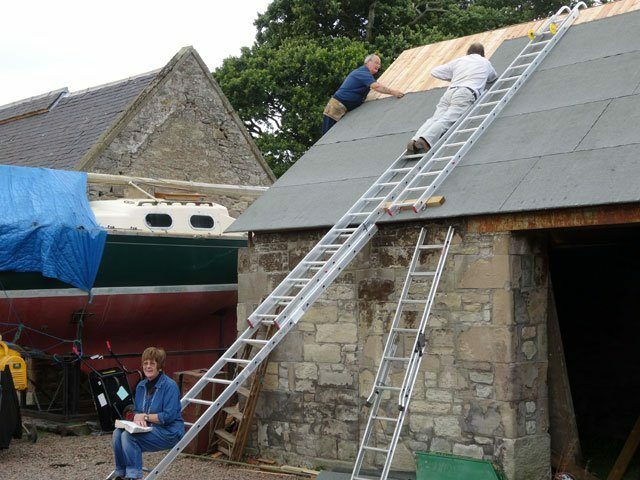 It is important to be able to grab onto the ladder to steady yourself. A tool belt or apron will ensure you have everything you need to work while still keeping your hands free. An extension ladder is a ladder that is made from two sections which slide out to create a longer ladder. These ladders must rest against another surface to stabilize them. These ladders are perfect if you are climbing onto a roof, or painting part of a building that's high off the ground. Extension ladders require the use of the 4-to-1 rule, which means that for every four feet of height to the surface the ladder rests on, the base of the ladder should be one foot out from it. A measuring tape will allow you to measure the height to the surface and find the exact spot the feet of the ladder should be placed at. As stated before, you should never carry tools in your hands while climbing a ladder. You need your hands free to steady yourself on the ladder. A tool belt or apron will allow you to carry your tools hands-free. If you wish to protect the surface the ladder rests against, or the surface you are placing the ladder on is slippery, use ladder covers. They not only protect the surface underneath the ladder, but they'll provide a non-slip grip on the feet of the ladder. The following is a ladder safety checklist that you should follow anytime you're going to use a ladder for a job or project. 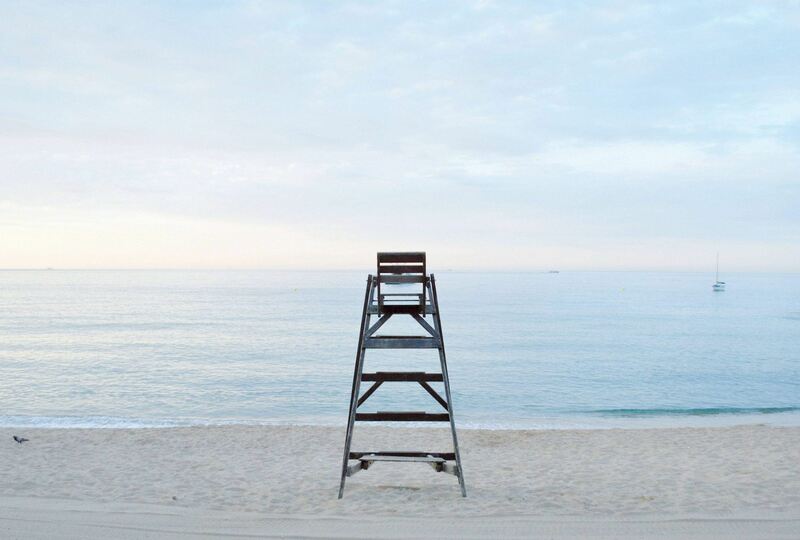 Think about what you'll be doing on the ladder, and how high you need to be. How high up do you need to go, and is there an available surface to lean the ladder on? If there is no available surface to lean the ladder upon, you'll need a step ladder. Step ladders are great when you're not going to be climbing very high, or if you need to do something over your head. If there is a need to lean the ladder on a surface to get close to where you need to be, you'll need an extension ladder. Extension ladders are good for climbing onto a roof, clean your gutters, or paint the siding or shutters. All ladders should be clearly marked with their maximum height. Choose a ladder with a maximum height close to the height you need for your job. Extension ladders, if being used to climb onto another surface like a roof, should have a maximum height at least three feet longer than what you need. Do not ever climb above the maximum working height for ladders. The ladder should always reach past the height you wish to work at. Ladders also come in different materials. Different materials are suited to different types of jobs, and have different precautions and weight limits. If you must work close to any power lines or open power sources, make sure your ladder is made of fiberglass or wood, not metal. 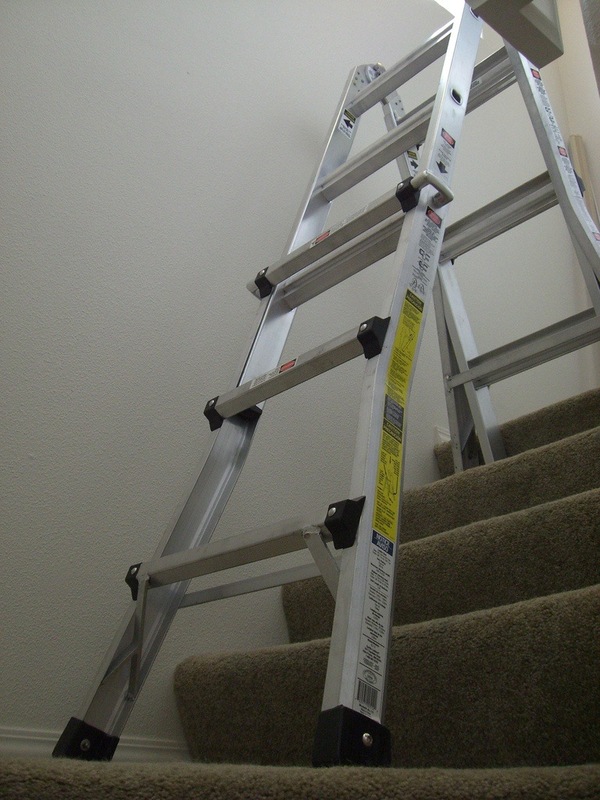 A metal ladder can conduct electricity, increasing the risk of shock. A manufacturer's label marked with type of ladder, weight limit, date and time of manufacture, and any warnings associated with the ladder. Nothing that would indicate the ladder shouldn't be used. A “Do not use” sign is a pretty clear indication. 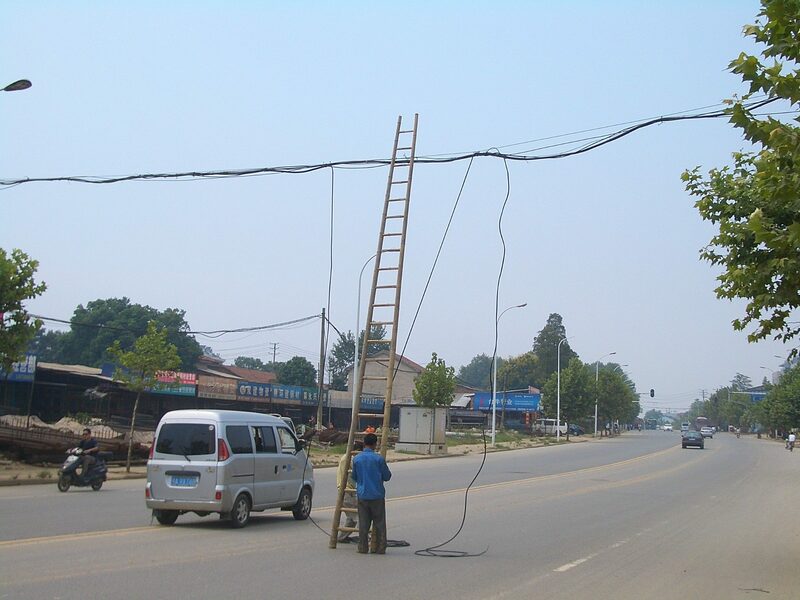 Ensure that the ladder is long enough for the job. Look for damage or wear. This can include burrs, rust or corrosion, breaks or cracks, etc. Check all connections and hardware, making sure no rungs are loose, all hardware is tightened, etc. That there is nothing on the rungs and that they aren't dirty or greasy, etc. Make sure the feet or non-skid grips are intact and functional. Make sure there is some kind of slip protection on all rungs. All metal parts are intact, such as welds, supports, etc. and free from cracks. Make sure all supports and braces are intact and functional, and that none have been removed. No damage, cracks, bubbles, etc. in all functional supports and pieces of the ladder. Make sure the spreader or extension lock is fully functional. Make sure there are no defective rung locks, ropes or pulleys. All locking mechanisms or wheels must be intact and operable. 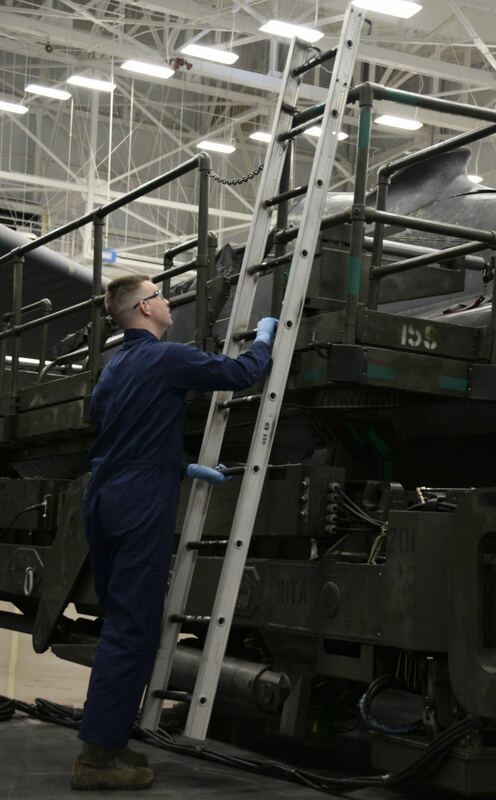 Handrails are required if the ladder is more than four steps, they must be attached and sturdy. How often should ladders be inspected? The answer is every time they are going to be used. 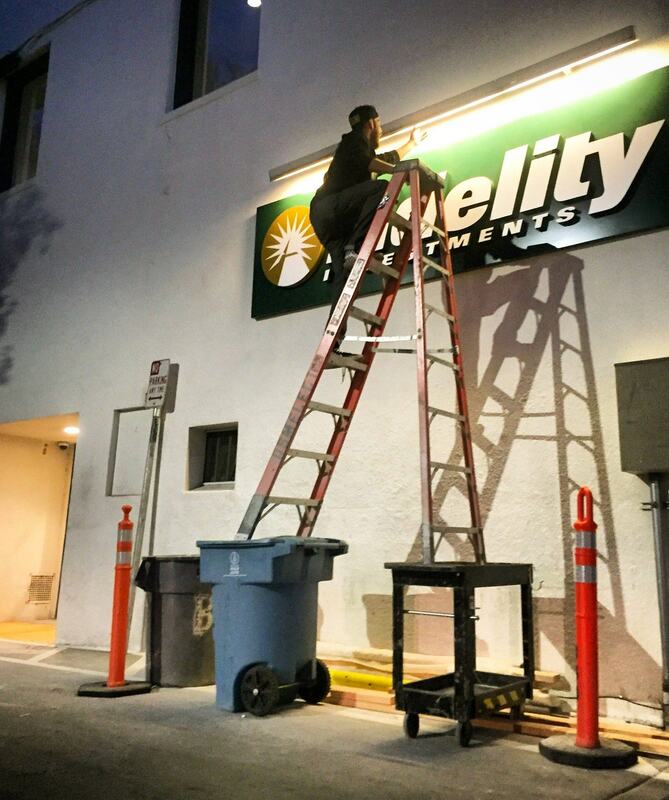 You should never set up a ladder without going through the safety checklist. Doing so increases your risk of injury or death, or damage to people and property around you. If you're using a step ladder, the legs of the ladder should always be fully extended, or separated as wide as they will go. 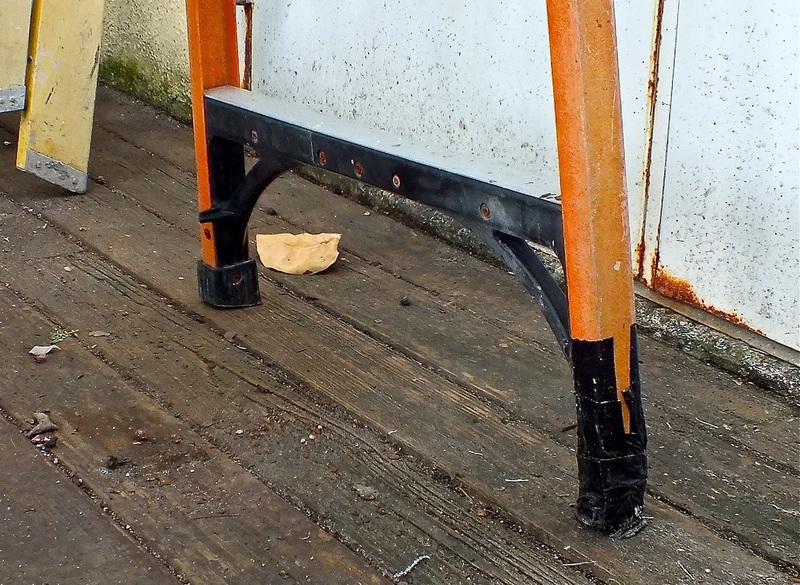 To ensure the safe use of stepladders, the ladder should have a spreader brace between the sides. Make sure this is pushed down as far as it will go. 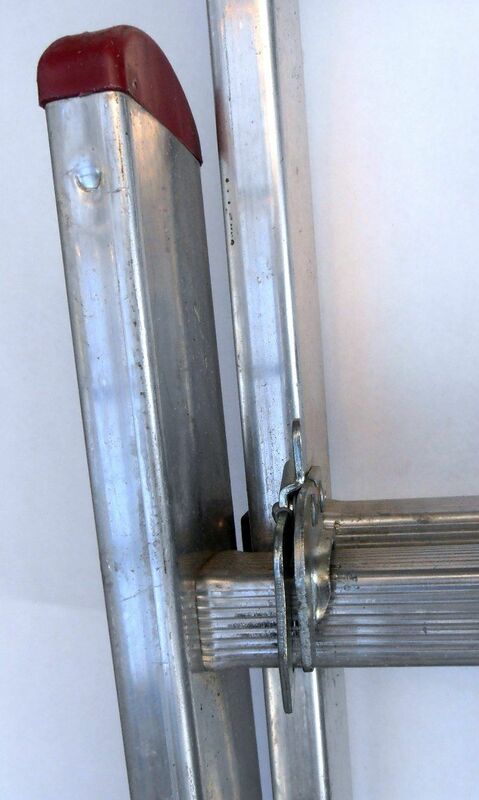 Some ladders have a locking mechanism on the spreader that snaps into place. Make sure that it clicks to show that it is engaged. To set an extension ladder up properly, you must follow the ladder angle rule, or the ladder safety 4 to 1 rule. This rule states that for every four feet of height to where the ladder rests, the base of the ladder should be one foot out. Picture the ladder as the hypotenuse of a right triangle. The height of the ladder to where it will rest is leg a, and the distance on the ground from that point straight out to where the feet rest is leg b. Leg a should always be four times the length of leg b. A good way to check that this rule has been followed is to stand up straight with your toes touching the feet of the ladder, and your arms stretched out straight in front of you. Your hands should be touching a rung of the ladder. 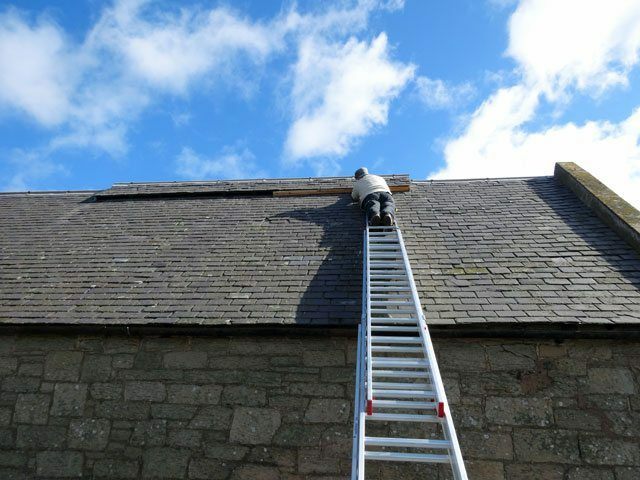 If they're not resting on a rung, you need to measure again and find the proper spot for the feet to rest, or risk the ladder sliding out or you tipping backward. 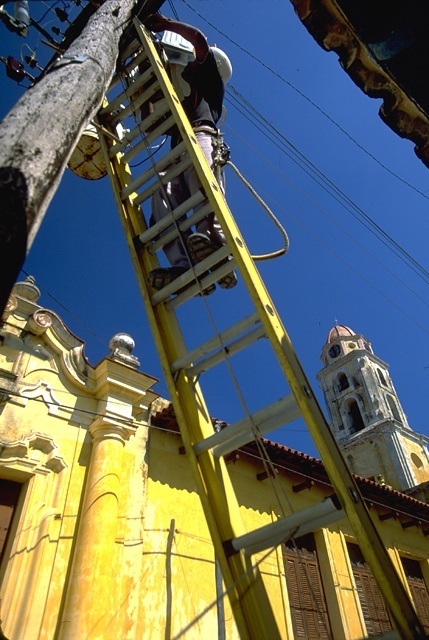 A ladder should never be set up less than ten feet from an electrical line or open power source. Putting the ladder any closer than that can lead to electrical shock, or even death. 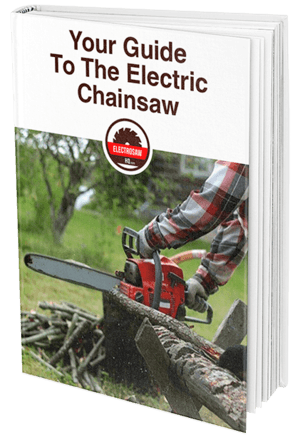 Also, if you are working anywhere near a power line or open electrical source, make sure that the ladder you are using is made of fiberglass or wood, not aluminum or any other type of metal. Metal conducts electricity easily, increasing the risk of shock or death. One of the most important things you need to do when setting up a ladder is to make sure that it is level. If not, the slightest shift in your weight can cause the ladder, and you, to come crashing down. Start by placing the ladder on the most even surface you can in the place you need it to be. Check it by placing a level on a rung of the ladder. If it is off, check the ground under the feet of the ladder. If one side is on a hill or lump of dirt, you can use the claw end of a hammer to dig a trench underneath it to level it. You can also use a shovel to fill and pack a divot in the dirt. Check the bottom of the ladder. The feet should have covers that slide away, revealing cleats or spikes underneath. These are made to dig into the ground to prevent the ladder from slipping. It on a smooth or hard surface, keep the covers in place, and make sure there is no dirt or debris on them. They should have a nonslip grip that keeps them from sliding. If not, you can buy ladder boots that slide over the feet of the ladder and keep them from slipping. You should never place anything under the ladder to level it. This can cause the ladder to be even more unstable. You can purchase leveling foot extensions that can be adjusted to make the ladder stable on uneven surfaces. If you are climbing onto roof, you must use an extension ladder, NOT a step ladder. The top of the ladder must extend three feet, or three rungs in most cases, above the edge of the roof. This ensures you can hold onto the rails of the ladder to stabilize yourself as you step on and off the ladder. One of the most important step ladder safety tips you'll need to remember is to make sure that the spreader bars between the legs of the ladder are pushed down as far as they will go. This locks the legs in place so that they are less likely to slip and cause injury. On the same note, one of the biggest extension ladder safety rules is to ensure the locking mechanism, which holds the extension in place, is locked. This will be some kind of latch attached to one side of the ladder that will usually clamp inside the rungs of the other side, holding it in place. If this rule isn't followed, the extension could slide down when you step on it, causing you and the ladder to fall to the ground. 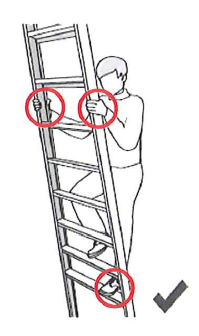 You must always make sure that you are making contact with the ladder in three places. This means either both feet and one hand or both hands and one foot should be on the ladder at all times. That way, there is no chance of shifting your balance and tipping off of the ladder. It can be tempting to turn around and reach something behind you when on a ladder. Don't do it. The only way to ensure your safety is to face the ladder. Even if you are following the three point rule, it is too easy to shift your weight forward and pull yourself and the ladder right to the ground. Never carry anything in your hands when climbing a ladder. Wear a tool belt, and if you need heavier items, tie a rope to a bucket and the other end to your belt loop. When you get to the point you need to be on the ladder, then you can untie the rope from your belt loop and pull the bucket up to you. Make sure you are still following the three-point contact rule while pulling the bucket up. Ladders have warning labels affixed to them, usually on the outside of one of the rails. They will tell you the weight limit of the ladder as well as any other safety concerns. Always follow the instructions on these labels. When figuring out the weight put on the ladder, you must not only consider yourself, but any tools or supplies you are carrying with you. Do not go over the limit on the label, or you risk the ladder collapsing underneath you. You should never stand on the top rung of the ladder, or even the one above it. These rungs are there for stability only, not for standing. 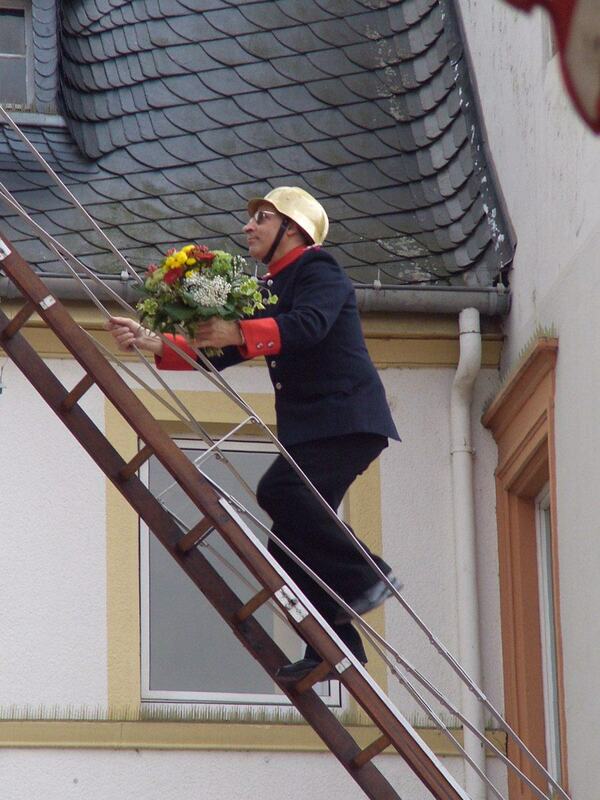 The third rung from the top of the ladder is the absolute highest you should climb. You should always make sure that your body stays within the limits of the rails while you're on a ladder. If your hip extends past the rail, you risk tipping yourself and the ladder over to the side and to the ground. You should always make sure the ladder is collapsed and stored away properly when you are done using it, even for the night. A ladder left in place is a safety hazard to everyone in the area. Children or pets could climb a ladder left out, endangering themselves and others. Someone could bump into it and tip it over, endangering themselves and any person or thing in its path when it falls. I hope that you found this article useful. It is very important to follow these ladder safety rules anytime you need to use one. Your health, safety, and the safety of those around you are extremely important. Taking the time to perform these steps won’t take much of an effort but it’ll guarantee you can perform your task with confidence and ease. Feel free to add more safety tips on the comment section below, and remember to share the article with your friends and family!